In fact, growth projections estimate that by 2022, ecommerce revenues will exceed $638 billion in the U.S. alone. They show that retail sales may exceed $4.058 trillion by as soon as 2020. But what’s exciting about this is that there’s still so much opportunity within the online marketplace. U.S. Department of Commerce data shows that ecommerce sales currently average about 9.1% of total retail sales. That means there is still endless opportunity for brands to launch an ecommerce website and to expand their reach. When you factor in the expanded ecommerce selling opportunities through omni-channel retail (like adding Amazon and eBay storefronts to your sales approach, for example), it’s easy to see that now is the best possible time to grow an ecommerce business. There has never been an easier time in history to build a business PERIOD. The cost of entry is lower than ever before. The ability to access & qualify experts is much easier. The ability to speak directly to your customers and make adjustments has never been easier. Essentially, ecommerce (or electronic commerce) is the buying and selling of goods (or services) on the internet. From mobile shopping to online payment encryption and beyond, ecommerce encompasses a wide variety of data, systems, and tools for both online buyers and sellers. Most businesses with an ecommerce presence use an ecommerce store and/or an ecommerce platform to conduct both online marketing and sales activities and to oversee logistics and fulfillment. Keep in mind that ecommerce has a few different spelling variations. All of these are synonymous and correct –– their use is largely preference-based. Let’s look at each type of electronic commerce in a bit more detail. B2C ecommerce ecompasses transcations made between a business and a consumer. This is one of the most widely used sales models in the ecommerce context. When you buy shoes from an online shoe retailer, it is a business-to-consumer transaction. B2B ecommerce relates to sales made between businesses, such as a manufacturer and a wholesaler or retailer. This type of ecommerce is not consumer-facing and happens only between business entities. Most often, business-to-business sales focus on raw materials or products that are repackaged or combined before being sold to customers. Training your customers to use the new B2B tools is important for adoption. Changing the way some customers do business with you can be a roadblock or a benefit. Position the change in a way that makes your customers’ lives easier. One of the earliest forms of ecommerce is the C2C ecommerce business model. Customer-to-customer relates to the sale of products or services between, you guessed it: customers. This would include customer to customer selling relationships like those seen on eBay or Amazon, for example. C2B reverses the traditional ecommerce model (and is what we commonly see in crowdfunding projects). C2B means Individual consumers make their products or services available for business buyers. An example of this would be a business model like iStockPhoto, in which stock photos are available online for purchase directly from different photographers. This model covers the transactions made between online businesses and administrations. An example would be the products and services related to legal documents, social security, etc. Same idea here, but with consumers selling online products or services to an administration. C2A might include things like online consulting for education, online tax preparation, etc. Both B2A and C2A are focused around increased efficiency within the government via the support of information technology. The history of ecommerce dates back further than you might think. It was initially introduced about 40 years ago in its earliest form. Since then, electronic commerce has helped countless businesses grow with the help of new technologies, improvements in internet connectivity, and widespread consumer and business adoption. One of the first ecommerce transactions was made back in 1982, and today, it is growing by as much as 23% year-over-year. 1969 The first major ecommerce company, CompuServe, is founded. 1979 Michael Aldrich invents electronic shopping. 1982 Boston Computer Exchange launches as one of the first ecommerce platforms. 1992 Book Stacks Unlimited launches as one of the first online marketplaces for books. 1994 Netscape launches Netscape Navigator, an early web browser, making it easier for users to browse online. 1995 Amazon and eBay launch. 1998 PayPal launches as an online payment system. 2000 Google launches AdWords as an online search advertising tool. 2005 Amazon launches Amazon Prime with expedited, flat-fee shipping for members. 2005 Esty, an online marketplace for handmade and vintage goods launches. 2009 BigCommerce launches as an online storefront platform. 2009 Square, Inc. is founded. 2011 Google Wallet launches as an online payment system. 2011 Facebook launches sponsored stories as a form of early advertising. 2014 Apple Pay launches as a form of mobile payment. 2017 Instagram shoppable posts are introduced. 2017 Cyber Monday sales exceed $6.5B. 1969 – CompuServe is founded. Founded by electrical engineer students Dr. John R. Goltz and Jeffrey Wilkins in 1969, early CompuServe technology was built utilizing a dial-up connection. In the 1980s, CompuServe introduced some of the earliest forms of email and internet connectivity to the public and went on to dominate the ecommerce landscape through the mid-1990s. 1979 – Michael Aldrich invents electronic shopping. English inventor Michael Aldrich introduced electronic shopping in 1979, which operated by connecting a modified TV to a transaction-processing computer via telephone line. This made it possible for closed information systems to be opened and shared by outside parties for secure data transmission – and the technology became the foundation upon which modern ecommerce was built. 1982 – Boston Computer Exchange launches. When Boston Computer Exchange launched in 1982, it was the world’s first ecommerce company. Its primary function was to serve as an online market for people interested in selling their used computers. 1992 – Book Stacks Unlimited launches as first online book marketplace. Charles M. Stack introduced Book Stacks Unlimited as an online bookstore in 1992 – three full years before Jeff Bezos introduced Amazon. Originally the company used the dial-up bulletin board format, but in 1994 the site switched to the internet and operated from the Books.com domain. 1994 – Netscape Navigator launches as a web browser. Marc Andreessen and Jim Clark co-created Netscape Navigator as a web browsing tool, and formally announced its introduction in October of 1994. During the 1990s, Netscape Navigator became the primarily used web browser on the Windows platform before the rise of modern giants like Google. 1995 – Amazon and eBay launch. 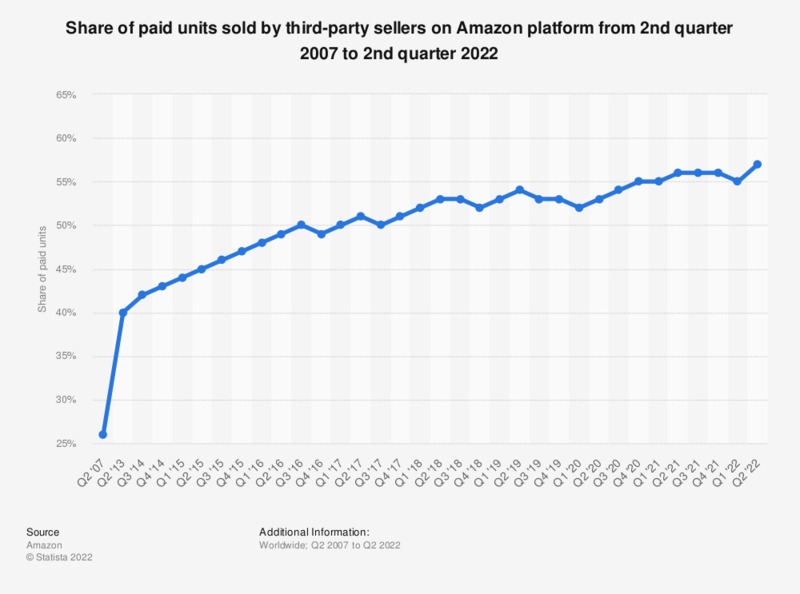 Jeff Bezos introduced Amazon in 1995 primarily as an ecommerce platform for books. That same year, Pierre Omidyar introduced AuctionWeb, which would later become what we know today as eBay. Since then, both have become massive ecommerce selling platforms that enable consumers to sell online to audiences around the globe. 1998 – PayPal launches as ecommerce payment system. Originally introduced as Confinity by founders Max Levhin, Peter Thiel, Like Nosek and Ken Howery, PayPal made its appearance on the ecommerce stage in late 1998 as a money transfer tool. By 2000, it would merge with Elon Musk’s online banking company and begin its rise to fame and popularity. Alibaba Online launched in 1999 as an online marketplace with more than $25 million in funding. By 2001 the company was profitable. It went on to turn into a major B2B, C2C, and B2C platform that’s still widely used today. 2000 – Google introduces Google AdWords as an online advertising tool. Google Adwords was introduced in 2000 as a way for ecommerce businesses to advertise to people using the Google search tool. With the help of short text ad copy and display URLs, online retailers began using the tool in a pay-per-click (PPC) context. 2005 – Amazon introduces Amazon Prime membership. Amazon introduced Amazon Prime in 2005 as a way for customers to get free two-day shipping for a flat annual fee. This strategic move helped boost customer loyalty and incentivize repeat purchases. Today, free shipping and speed of delivery are the most common requests from online consumers. 2005 – Etsy is launched. Etsy launches in 2005, allowing crafters and smaller sellers to sell goods through an online marketplace. This brought the makers community online –– expanding their reach to a 24/7 buying audience. Square was founded in 2009 by Jack Dorsey and Jim McKelvey. The first Square app and service launched in 2010. Square allowed offline retailers to accept debit and credit cards in their brick-and-mortars and absolutely anywhere for the first time ever. The idea occurred to Dorsey when in 2009 when McKelvey (a St. Louis friend of Dorsey at the time) was unable to complete a $2,000 sale of his glass faucets and fittings because he could not accept credit cards. Eddie Machaalani and Mitchell Harper co-founded BigCommerce in 2009 and introduced it that year as a 100% bootstrapped ecommerce storefront platform. Since then, more than $8 billion in sales have been processed through the platform and the company now has headquarters in Austin, San Francisco, and Sydney. Other ecommerce technology platform providers launched in the same era. 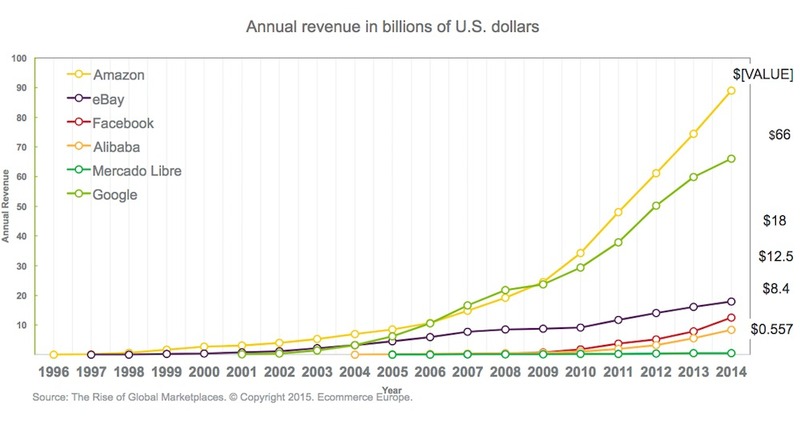 Shopify (2006) and Magento (2008) are also recognized as market leaders alongside BigCommerce. Internet Retailer’s 2018 Guide to the Top Ecommerce Platforms saw all 3 of these platforms on the list –– with BigCommerce annual store growth and revenue numbers topping out at #1. 2011 – Google Wallet introduced as digital payment method. Google Wallet was introduced in 2011 as a peer-to-peer payment service that enabled individuals to send and receive money from a mobile device or desktop computer. By linking the digital wallet to a debit card or bank account, users can pay for products or services via these devices. Today, Google Wallet has joined with Android Pay for what is now known as Google Pay. 2011 – Facebook rolls out sponsored stories as a form of early advertising. In 2011, Facebook began rolling out early advertising opportunities to Business Page owners via sponsored stories. With these paid campaigns, ecommerce businesses could reach specific audiences using the social network and get in the news feeds of different target audiences. Stripe is a payment processing company built originally for developers. It was founded by John and Patrick Collison. 2014 – Apple Pay introduced as mobile payment method. As online shoppers began using their mobile devices more frequently, Apple introduced Apple Pay as a mobile payment and digital wallet tool that allowed users to pay for products or services with an Apple device. Jet.com was founded in 2014 by entrepreneur Marc Lore (who had sold his previous company, Diapers.com, to Amazon.com) along with Mike Hanrahan and Nate Faust. The company competes with Costco and Sam’s Club, catering to folks looking for the lowest possible pricing for longer shipping times and bulk ordering. 2017 – Shoppable Instagram is introduced. Instagram Shopping launched in 2017 first with ecommerce partner BigCommerce. Since then, the service has expanded to additional ecommerce platforms and allows Instagram users to immediately click an item, and go to that product’s product page for purchase. 2017 – Cyber Monday sales exceed $6.5B. In 2017, ecommerce growth breaks a new record with online sales breaking $6.5 billion on Cyber Monday – a 17% increase from the year before. Mobile sales also break records with an excess of $2 billion in sales made via mobile devices. The impact of ecommerce is far and wide with a ripple effect on everything from small business to global enterprise and beyond. 1. Large retailers are forced to sell online. For many retailers, the growth of ecommerce has expanded their brands’ reach and has positively impacted their bottom lines. But for other retailers who have been slow to embrace the online marketplace, the impact has been felt differently. At a high level, retailers that fall into the middleground are the ones feeling the biggest changes in response to the impact of ecommerce. Foursquare data shows discount stores and luxury retailers are maintaining their footholds with consumers, but ecommerce adds to the fierce competition for retailers within the mid-tier. Research also indicates that one type of retailer in particular has seen a major impact from the rise of ecommerce: Department stores. As Amazon becomes consumers’ go-to source for products traditionally purchased at department stores, chains like Sears and Macy’s (for example) have seen decreased sales across the board. 2. Ecommerce helps small businesses sell directly to customers. For many small businesses, ecommerce adoption has been a slow process. However, those who’ve embraced it have discovered ecommerce can open doors to new opportunities that were never possible before. Slowly, small business owners are launching ecommerce stores and diversifying their offerings, reaching more customers, and better accommodating customers who prefer online/mobile shopping. Gallup research shows that 2 in 10 small businesses have expanded their ecommerce presence over the last two years, and 11% say they plan to increase their ecommerce efforts in the coming year. Your customers aren’t just buying your product, they’re buying into an identity. Selling t-shirts is one thing; you may get some sales and some devoted fans. But selling a lifestyle of what those t-shirts unlock will lead to much more long-term success. Think about why people choose to wear a brand like Patagonia, for example. They could easily purchase the same exact apparel options at North Face, REI, or dozens more. But Patagonia stands out because of the environmental activism. They practice what they preach, they stand for something, and they’ve built a lifestyle around their brand –– for people who love the outdoors and want to preserve it. 3. B2B companies start offering B2C-like online ordering experiences. Data from Four51 indicates that in the B2B world, ecommerce will account for the majority of sales by as soon as 2020 – while other data sets show that 79% if B2B customers already expect to be able to place orders from an ecommerce website. Ecommerce solutions enable self-service, provide more user-friendly platforms for price comparison, and helps B2B brands better maintain relationships with buyers, too. What’s more: Scholarly research indicates ecommerce has made a large positive impact in the B2B market by enabling process improvements and lowering operational costs overall. B2B customers are thinking more like B2C customers everyday, and need to be marketed to accordingly. B2B buyers are increasingly millennials, who approach sales differently. B2B brands need to be online and adjusting their pitches and sales technique for this new generation of buyer. – Rieva Lesonsky, CEO, GrowBiz Media & SmallBizDaily.com. 4. The rise of ecommerce marketplaces. Ecommerce marketplaces have been on the rise around the world since the mid-1990s with the launch of giants we know today as Amazon, Alibaba, and others. In the chart below, we can see that Amazon is the outlier in regard to ecommerce marketplace growth, but we can see that others are making headway. By offering a broad selection and extreme convenience to customers, they’ve been able to quickly scale up through innovation and optimization on the go. Amazon in particular is known for its unique growth strategy that has helped them achieve mass-adoption and record-breaking sales. But Amazon doesn’t do this alone. As of 2017, 51% of products sold on Amazon were sold by third-party sellers (i.e. not Amazon). Those sellers also make high profits from the sales on the marketplace, though they are required to follow strict rules enforced by Amazon. 5. Supply chain management has evolved. Survey data shows that one of ecommerce’s main impacts on supply chain management is that it shortens product life cycles. As a result, producers are presenting deeper and broader assortments as a buffer against price erosion. But, this also means that warehouses are seeing larger amounts of stock in and out of their facilities. In response, some warehousers are now offering value-added services to help make ecommerce and retail operations more seamless and effective. Separation of stock/storage for online vs. retail sales. 6. New jobs are created but traditional retail jobs are reduced. Jobs related to ecommerce is up 2x over the last five years, far outpacing other types of retail in regard to growth. However, growth in ecommerce jobs is only a small piece of the employment puzzle overall. Scholars indicate that ecommerce will continue to directly and indirectly create new jobs in the high-skill domains like the information and software sectors, as well as around increased demand for productivity. The flip side of this, however, is that upticks in efficiency paired with a shift away from traditional retail may lead to some job losses or reductions in workforces as well. As with any major market shift, there are both positive and negative impacts on employment. Ecommerce (and now omni-channel retail) has had a major impact on customers. It is revolutionizing the way modern consumers shop. Today, we know that 96% of Americans with access to the internet have made a purchase online at some point in their lives and 80% have made a purchase online in the past month. And not only do customers frequently use ecommerce sites to shop: 51% of Americans now prefer to shop online rather than in-store. Millennials are the largest demographic of online shoppers (67%), but Gen Xers and Baby Boomers are close behind at 56% and 41% participating in online shopping activities respectively. Omni-channel is where it’s at. Take Carter’s for example. Only 12% of their customers today are “multi-channel” or “omni-channel” shoppers – meaning they shop in person in stores and online. But, they spend 2X to 3X as much as a single-channel customer (store-only or online-only). That leaves a lot of room for organic growth simply by getting existing customers to use another channel (online or in person). 8. Social media let’s consumers easily share products to buy online. Researchers have discovered that ecommerce has made an interesting social impact; especially within the context of social media. Today, ecommerce shoppers discover and are influenced to purchase products or services based on recommendations from friends, peers, and trusted sources (like influencers) on social networks like Facebook, Instagram, and Twitter. If you’ve ever been inspired to buy a product you saw recommended on Facebook or featured in an Instagram post, you’ve witnessed this social impact as it relates to ecommerce. If you set up an ad that acquires a customer for $10, that’s good. Assuming that’s profitable for you based on your CoGs, etc., then keep scaling your ads. You’ll get so many sales you won’t be able to keep up with inventory and shipping. 9. Global ecommerce is growing rapidly. Around the world, ecommerce is growing. Forbes reported in 2016 that 57% of people surveyed in 24 countries across six continents had made an online purchase in the past six months. And ecommerce’s global impact has been especially large in countries like China – eclipsing growth in all other countries. Since 2014, China has seen major increases in sales each year – and it’s projected that by 2019, the country will have nearly $2 billion in retail ecommerce sales on its own. The biggest opportunity brands have today is reach. Online brands have the possibility to reach an unlimited audience globally. It’s very difficult to do, but I believe that’s the greatest opportunity for online businesses. Ecommerce has many different advantages – from faster buying to the ability to reach large audiences 24/7. Let’s take a look in detail at some of the top perks it has to offer. 1. Faster buying for customers. For customers, ecommerce makes shopping from anywhere and at any time possible. That means buyers can get the products they want and need faster without being constrained by operating hours of a traditional brick-and-mortar store. 2. Companies can easily reach new customers. Ecommerce also makes it easier for companies to reach new customers all over the globe. An ecommerce store isn’t tied to a single geographic location – it’s open and available to any and all customers who visit it online. With the added benefit of social media advertising, brands have the potential to connect with massive relevant audiences who are in a ready-to-buy mindset. Build a community for your brand. Community building is a long term play and an underrated asset. But for good reason: it’s hard to build an authentic community. Building a robust and lively Facebook community at ConversionXL helped us tap into customer insights and get natural customer feedback, but it also opened a direct line of communication with customers and fans of the brand in general. The discussions that happen there now, organically, are amazing and the community is a valuable thing on its own, outside of any branding/acquisition concerns. Without a need for a physical storefront (and employees to staff it), ecommerce retailers can launch stores with minimal operating costs. As sales increase, brands can easily scale up their operations without having to make major property investments or having to hire large workforces. This means higher margins overall. With the help of automation and rich customer profiles, you can deliver highly personalized online experiences for your ecommerce customers. Showcasing relevant products based on past purchase behavior, for example, can lead to higher AOV and makes the shopper feel like you truly understand him/her as an individual. In very recent history, Amazon Go’s blending of technology and customer data to create a new retail shopping experience is something all brands need to examine for takeaways. Although modern ecommerce is increasingly flexible today, it still has its own set of disadvantages. Here are some of the downsides to ecommerce retail. 1. Limited interactions with customers. Without being face-to-face, it can be harder to understand the wants, needs, and concerns of your ecommerce customers. There are still ways to gather this data (survey data, customer support interactions, etc. ), but it does take a bit more work than talking with shoppers in person on a day-to-day basis. I think the biggest shift in retail in recent history is the ability to have a direct conversation with your customer. In the past, CEOs wouldn’t necessarily be on the front line of sales. But, with social media & ecommerce, you have the ability to have a direct conversation with a massive portion of your customer base. These conversations can lead to better marketing that speaks your customer’s language, better products by asking your customer what they really want, more successful product launches by gaining customer input, and direct advice on how to improve overall. 2. Technology breakdowns can impact ability to sell. If your ecommerce website is slow, broken, or unavailable to customers, it means you can’t make any sales. Site crashes and technology failures can damage relationships with customers and negatively impact your bottom line. 3. No ability to test or try-on. For shoppers who want to get hands-on with a product (especially in the realm of physical goods like clothing, shoes, and beauty products) the ecommerce experience can be limiting. However, with the help of video, product images, and even VR technology, companies are finding new ways to overcome this aspect of the online shopping experience. Research predicts that the future of ecommerce is a bright one. By 2022, ecommerce revenue in the U.S, alone is expected to reach $638 million, with the toys, hobby and DIY vertical seeing the largest growth. And it’s no passing trend, either. Many Americans now see online shopping as a must-have: 40% say they can’t live without it. 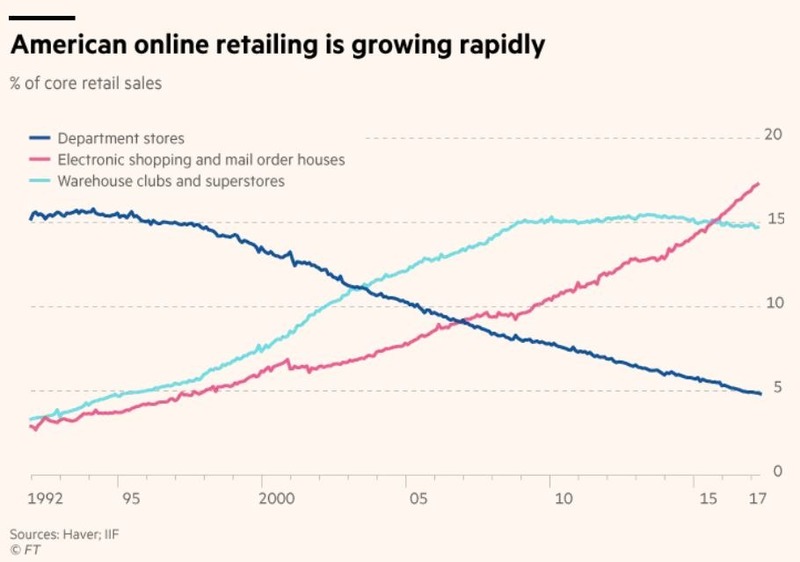 It’s also interesting to note that looking ahead, ecommerce expert Gary Hoover’s data projects ecommerce retail sales will eventually even out with that of brick and mortar. This means that even though the online sales trend will continue to grow, there’s plenty of business to go around. Experts also predict that, soon, most ecommerce interactions will be an omni-channel experience for shoppers. Robust customer journeys and personalization. Overall, we have to remember that ecommerce is still fairly new in the big picture of retail. The future holds endless opportunity, but its success and continuation will largely depend on buyers’ preferences in the future. What are the main features of an ecommerce website? Most customers look for a few key features when evaluating an ecommerce website. These are elements that improve the overall online shopping experience by making it highly functional and user-friendly. Easy to use features: Simple navigation tools, easy checkout flows, etc. Yes, ecommerce is safer than ever before. With the help of multi-layered ecommerce security, monitored transactions, regular PCI scans, SSL certification, protection against DoS/DDoS attacks, and hosting solutions that are PCI compliant, ecommerce stores can offer shoppers the peace of mind that their online purchases are made in a 100% safe and secure environment. Ecommerce fulfillment encapsulates the entire process of receiving an order and shipping it to the customer. This includes all of the operational and logistical steps that are part of this process, such as inventory management, warehouse organization, order oversight, packaging and shipping, and customer communication regarding order fulfillment. This aspect of an ecommerce store can be outsourced to an order fulfillment service or managed via dropshipping. An ecommerce marketplace is a type of site where products or services are sold and then processed by the marketplace operator. These include selling platforms like Etsy, Amazon, and eBay, for example, which are often part of an omni-channel sales strategy. What are some examples of popular online marketplaces? An ecommerce platform is a software tool that allows retailers to build and customize digital storefronts and to manage their website, sales, and ecommerce operations from a central hub. What is a hosted ecommerce platform? A hosted ecommerce platform is one that handles all website hosting responsibilities rather than requiring the individual to do so via a third party solution. This removes much of the complexities around managing the software of your ecommerce operation and is often cheaper than self-hosting. In hosted ecommerce platforms, the platform handles updates, security, and other related tasks for the store owner, who is essentially renting the software from them. BigCommerce is an example of a hosted (SaaS) platform.